Follow the adventures of Faye, Fidget, and their daughter Lyra from the beginning with this fantastic game bundle. 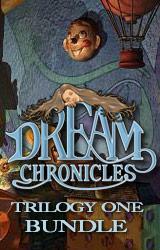 Wake the town of Wish to find Fidget in the original Dream Chronicles. Rescue Faye from the evil Lilith in Dream Chronicles - The Eternal Maze. Finally, help Faye recover her memory and rescue Lyra from the clutches of Lilith in Dream Chronicles - The Chosen Child. Each magical journey offers a thrilling story with countless hidden object searches and puzzles to solve. Enjoy beautiful scenery, entertaining mini-games, and an expansive world that becomes even more enchanting with each tale. The Dream Chronicles bundle is a thing that every fan must have especially the ones who didn’t even try to play this game. With its magnificent story and gameplay this game is a dream for itself, but let’s review release after release. 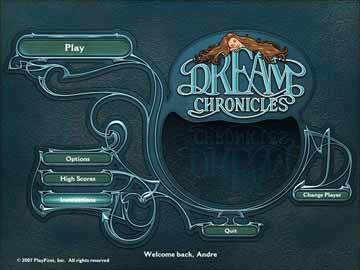 Dream Chronicles is an elegantly made fantasy adventure games type of game, mixed with elements of problem solving and searching puzzles that follows a beautiful storyline of the heroine Faye's quest to rescue her family and the world from the Sleep Spell cast by the Fairy Queen Lilith. Explore 18 wonderfully constructed environments, each with intricately detailed objects and animation, as you solve the puzzles and search for the Dream Jewels scattered throughout the different locations to give you the power to overcome the Dream Spell. There is a range of puzzles for the players to solve, ranging from logic to lateral thinking. Interact with the objects and environments as you search for clues and objects that will guide you closer to the path to removing the Dream Spell. As you advance the plot of the story, you will also discover more about our brave heroine's past, and the events that have led to the casting of the terrible Dream Spell. But in order to do so, you must hone your wits and your eyesight, because all the clues are hidden on the screen waiting for you to uncover. This is a very stylish and well-contained game, with a smooth flowing plot and game play to carry the story. The graphics and visuals are simply outstanding, and facilitate a deep sense of immersion into the story. Also supporting the game are the beautiful music and easy-to-use game controls, adding more credits to a professionally developed and technically sound game. There are no annoying or ambiguous clues or puzzle games in it, and the overall flow of the game and plot is well-paced, so the game is easy to follow and enjoy which makes it part of cool games set. 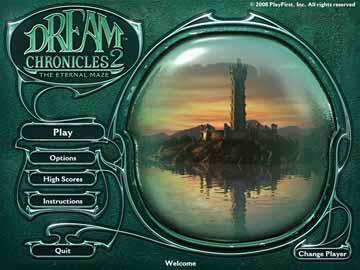 Dream Chronicles – The Eternal Maze picks up where its predecessor ended. The queen of Fairy’s is still up to no good, and following her evil plans. Faye is trying everything in her mortal power to save her husband and her daughter from the hands of Lilith. Puzzle after puzzle, piece after piece, Faye is getting closer to her goal and the solution to the problem with the fairy queen. There are 50 levels to be accomplished and finished but unlike before you won’t be solving a puzzle after a puzzle, rather than you will be searching for items in other levels so you can go back to that puzzle and solve it, which gives the game some backtracking, but nothing that will spoil your gameplay. On the contrary it will have a totally opposite effect. So you will notice a nice number of items in your inventory waiting to be used, and you don’t have to worry about leftovers because as soon as the item has done it purpose it vanished from the inventory. Moreover, each scene usually incorporates multiple brainteasers. For example, near the start of the game you're presented with a scene of a large tree. Several pieces of outer bark are removed to reveal the carved shapes of five animals. You will then try to locate the five animals, put them in your inventory, and then use them and put them in their wright places, after which the originals appear. Returning those originals to their correct places will open the doors in walls and allow you to move forward. There are lots of puzzles in the game to be completed and most of them require some item to be collected as a condition for solving. You will be collecting Dream Pieces and Dream Jewels. The only thing that could be criticized in the game is a couple of misspellings in the game, which was one of the stronger sides in its predecessor. The graphics and sound is still something that can be touched with any critics, as the quality still remained. 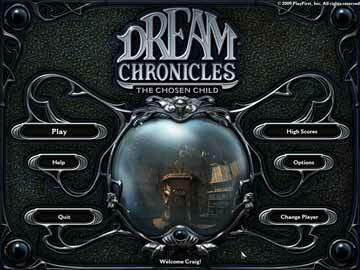 Dream Chronicles 3 - The Chosen Child is the third installment in the adventure games series Dream Chronicles. It is an engrossing adventure as you journey along the paths and mazes of the dreamy world with Faye, the main hero of the series. The sequel to Dream Chronicles 2 has a coherent story line which leads the player on a quest full of challenging puzzles and tasks. There are no lists of items to be spotted like in the average hidden object game genre and you can explore the mystical realms and follow the story to solve logical puzzles and pick up clues on what to do next. Creating magical potions, looking for constellations with the help of telescope, piecing together a sewing machine, unscrambling words, playing Simon and sliding games, locating items in the right place are some of the tasks that you perform throughout the game. A magical world of discovery awaits you to play games for free and uncover hidden clues to help Faye save her daughter from Fairy Queen Lilith and reveal the secret prophecy. The Chosen Child introduces the Nexus (akin to Mist) which is a series of gateways that allow you to travel to different interconnected locations after you figure out how to unlock them. Unlocking the nexus requires special devices which would be available as you gather dream pieces and gold nuggets along the game. The visuals and the breathtakingly gorgeous scenes in the game are a pleasure. The enchanting background score adds to the charming dream world effect. The hint system and the length of the game disappoint a bit but overall it is one of the greatest hidden object adventure games of the decade. This is one online games download you don't want to miss. But what many of the fans noticed is that the third installment only brought the news about the fourth chapter making it worth of waiting.